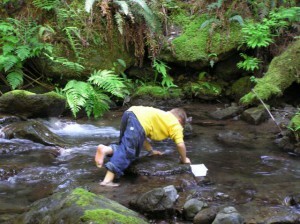 A student searches for aquatic invertebrates, an important food source for salmon, in Honeydew CreekThe Mattole Ecological Education Program (MEEP) works in all six local public schools, providing assistance to teachers for field-based and classroom instruction on ecological topics both local and global. Throughout the school year, Council staff work with teachers to bring ecological education to the classroom. Additionally, guest presenters bring fresh information on salmonids to students. Recent topics have included learning about sea lice—a devastating parasite afflicting both wild and farmed salmon—to learning, from native peoples, about historical salmon-fishing practices. 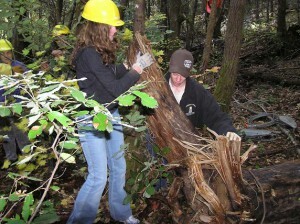 After learning about the benefits of large wood to salmon habitat, Whale Gulch students work with biologists to move a large log into the Mattole. The Council gives students the opportunity to assist the MRC, fellow restoration groups, and government agencies with projects designed to improve salmon habitat and reduce erosion. These projects have included watershed monitoring, mulching decommissioned roads, planting native trees in riparian zones, constructing sustainable trails above salmon-bearing streams, and weaving willow mats. Regular field trips transport students to a variety of habitats around the watershed, including trips to river and creek habitats, to the beach and tidepools, and to forests, where students can contemplate their role in the watershed. They may also explore the surrounding environs of their respective schools.